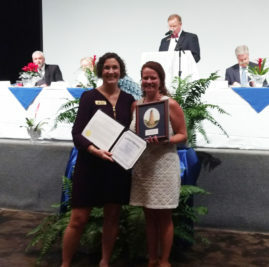 Katrina R. Knight receives Tri-HIC Impact Award from the Cape Fear Council of Governments | The mission of Good Shepherd Center is to feed the hungry, shelter the homeless and foster transition to housing. Cecelia Peers, Continuum of Care Administrator for the Council, nominated Ms. Knight for her work with Good Shepherd’s SECU Lakeside Reserve, a 40-unit affordable housing development for chronically homeless adults with a disability. “We know that Lakeside has had a huge impact on our ability to house the chronically homeless and can get us close to having enough units of permanent supportive housing to meet the needs of our chronically homeless population,” said Ms. Peers. “Katrina’s staunch advocacy has been invaluable,” Ms. Peers added.